← Parma Number 42: Stones Corner Hotel … Gazpacho on chicken does not for a good meal make! The Verdict: For the first time in a while my Parma test this week was in a CBD pub, in this case the Stock Exchange Hotel. This Parma had a lot of great elements but was let down by two of the, I believe, simplest elements of the dish: the cheese and the salad. It also was not the most photogenic of Parmas, based on some of your comments on Facebook and Instagram. Chicken: The chicken piece was quite large, well crumbed and had been cooked perfectly. It was rather thick which sometimes is not the hallmark of a pub chicken parmigiana. Tomato Sauce: Another great element of this dish was its sauce. It covered the chicken piece well and tasted great. It complemented the elements of the chicken part of the dish very well. Ham: Despite it not being the most photogenic piece of ham sampled this year, the Stock Exchange Parma’s ham was the hero of the dish even though coverage wise it was a little deficient. The piece of ham was folded over to fit it on the chicken piece and tasted great. Cheese: Surely melting the cheese on a chicken parmigiana is the easiest part of the dish? The cheese on the Stock Exchange chicken parma had the taste and consistency of a melted piece of processed cheese. Coverage of the chicken piece was also an issue. Side Dishes: The other element of a chicken parmigiana that I would have presumed would be fairly simple to get right is the salad. Unfortunately the salad on this chicken parma was very ordinary. Bland and without dressing it really took away from the other side dish, the chips, which were fantastic. The chips were well salted, plentiful and crisp. Presentation: This chicken parmigiana was quite large and, unfortunately, was squashed into a fairly small plate. The Venue: The Stock Exchange Hotel is a pub in the Brisbane CBD. It was completely revamped in 2014 with new ownership, management and a refit of its bars and kitchen. The public bar and TAB area is quite large for a CBD pub. The chicken parmigiana cost $22. The final word: The Stock Exchange Hotel is one of the premium pub venues in Brisbane. Unfortunately, its chicken parmigiana did not match the quality one associates with such a venue. It had some excellent elements but the very ordinary cheese and the even worse salad ruined any prospects this offering had for the crown of the “Robert Parma”. 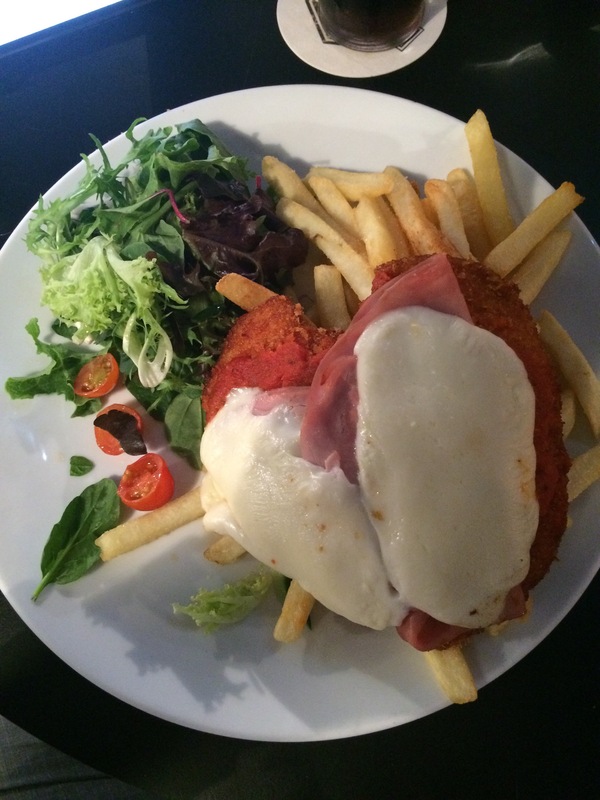 This entry was posted in Uncategorized and tagged Brisbane, brisbane food, brisbane's best parma, chicken, chicken parmigiana, stock exchange hotel. Bookmark the permalink. 1 Response to Parma Number 43: The Stock Exchange Hotel … sometimes the easiest things are the most difficult to get right! Not a huge fan of the Parma personally but have been enjoying your Quest! Looking forward to November and seeing if anyone can take the Robert title!